Lets take a look at how to handle the pre-flop action in the early stage of a poker tournament. Although it may seem like this is only a small part of a hand, it actually sets the foundation for the rest of the hand, and is important for that reason alone. In addition, since it is no limit, things can quickly escalate even pre-flop, so it’s key to know what is going on at this stage of the game. Poker professional Chris Ferguson said in an interview once that if your hand is not good enough for a preflop raise you should fold it. He also said he shakes his head when he see’s so many player’s limp into pots preflop (just call the big blind). It’s hard to argue his logic when it is backed up by the success he has had ! I’m kind of on the fence with this issue. I mostly agree with him, in that the majority of the hands you play, you want to be the aggressor, however I think in the early stages of poker tournaments there are some exceptions to this. In the early stages of a tournament as we discussed in the last article I will play some speculative hands if the right opportunity arises. For these speculative hands I will try and get to see the flop as cheaply as possible with hands that have big flop potential. If you hit the flop with these hands you can usually extract a lot of chips from your opponent if he has caught any piece of it. I’m a big believer in good chip stack management. I’m usually playing these hands from the button or cutoff but if the small blind or big blind put in a raise I’m usually folding there and not losing more chips, the raise has just increased the risk so I’m out of there. If you are in early position, you should usually only enter the pot with very strong hands like big cards and big pairs. This is because there are many people to act after you and anyone who calls will get to see what you do on each street before they have to act, which is very disadvantageous for you. In late position, you can be much more willing to call with weaker hands such as these speculative hands we are looking to play, because there is less chance of you getting raised off of them pre-flop, plus you will get to see what opponents do on each street to help you decide how to proceed and enable a quick getaway after the flop if you do not connect. For our premium hands there is no debate, we are playing aggressive and will bet and raise and make our opponents pay to see any cards and to try and ensure we are only playing against one opponent. In no limit tournaments, there may be times where it is advantageous to get it all-in pre flop. If you are a short stack and the blinds and antes are getting big in comparison to your stack then it may be the best option to just put maximum pressure on your opponents and give yourself the best fold equity (chance that you can win the pot by your opponent folding) by getting it all in preflop. In these sorts of situations anyhow you will usually find that you are pot committed by making or calling a standard raise with a short stack so you may as well move all-in and get some fold equity as well. If you have raised before the flop, it’s often a good idea to bet the flop whether it hits you or not. The probability that you will hit the flop is only 30% and that is just the same for your opponent, so that means that 2 times out of 3 he has missed the flop. If you were the aggressor before the flop and continue to be aggressive with a continuation bet after the flop then he will probably just fold after the flop if he has missed. 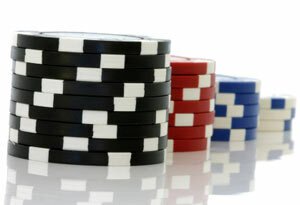 Exceptions are when three or four players called your raise, you missed the flop and are first to act; or when the flop is very dangerous for your hand, such as all hearts when you have As Ks, or a big pair on the flop that you do not have a matching card for, or when you picked up some sign of strength from one of the other players, either in how they called your pre-flop raise or their reaction to the flop. As the tournament progresses into the middle and late stages my attitude slowly shifts toward the raising side of this issue. As the blinds get larger playing speculative hands gets more and more expensive and it becomes more important to introduce fold equity into your game plan. We will cover fold equity later on in the guide but to get fold equity you need to be the aggressor in a pot and this then gives you a second chance to win the pot by your opponent folding (other way being holding the best hand). Also in the later stages of a tournament the gap concept comes more into play. Again we will cover this in a later section so I won’t go into too much detail but what this basically means is that you need a stronger hand to call a raise than you do to make a raise.